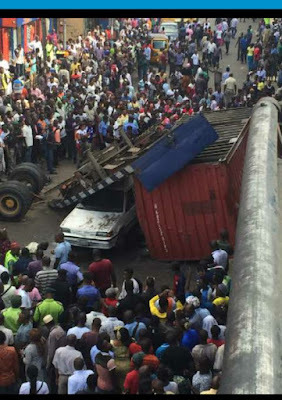 A moving trailer fell off from the Ojuelegba bridge in Lagos at about 5 p.m on Wednesday. A crowd immediately gathered at the scene helplessly awaiting the arrival of a rescue team. As at the time of this report, it was not certain if there were any casualty. An eye witness however said that the occupant of the car escaped unhurt, but no one knew the fate of the occupant of the Sport Utility Van.